Paradise Cove Is Too Far: It could’ve been the name of one of the sixties TV dramas Paul Wendkos directed, during the years when shows like Naked City and Ben Casey competed to come up with the longest and most cryptic segment titles. “Ten Days For a Shirt-Tail” and “The Wild, Wild, Wild Waltzing World” were actual television episodes from Wendkos’s resume. But Paradise Cove Is Too Far is not one of his credits; it’s a note I found scrawled on my folder for Wendkos, at the end of a set of directions to his Malibu home. I never made the trip to just-before-Paradise Cove. For the last few years, I’d been talking to his wife, Lin Bolen Wendkos (the inspiration for Faye Dunaway’s character in Network, according to rumor, but hopefully not for the more terrifying aspects of that character) about meeting Paul for an interview. But he’d suffered a stroke shortly before I got in touch and remained too frail for the kind of in-depth questioning that I would have needed to toss his way. I kept calling every time I was in Los Angeles, hoping that I’d catch him on a good day, but I never did. Wendkos died last month, on November 12. Since I started making notes for this piece, good obituaries have appeared in the New York Times and the Independent, so I don’t feel obligated to outline the whole of Wendkos’s long career. He began with a regional independent film, The Burglar, which is a common way for directors to enter television now, but was extremely unusual then. The Burglar is an impeccable film noir. It derives from a novel by David Goodis, the reclusive Philadelphia native whose home town figures essentially in most of his prose. Wendkos also hailed from Philly and deployed his camera along its streets with a knowing eye; he was a perfect match for the material, as was surly sad-sack star Dan Duryea. The Burglar led immediately to a feature contract and a number of mostly commercial films for Columbia, including Gidget and its two sequels, which led off most of his obits. Wendkos disowned most of his studio films, considering them too compromised, although film buffs make claims for The Case Against Brooklyn and the western Face of a Fugitive. The oddity from among Wendkos’s early films, another indie called Angel Baby, has a small cult following that may grow following its recent sort-of DVD release (in Warners’ new burn-on-demand library). More on Angel Baby further down. Television is a talk medium. The cinema is basically a behavioral medium, an action medium, people do things to generate a story. [I]n television they talk about doing things. You’re dealing with incredible professionalism in this field. All the scripts are tailored for five to seven day schedules and it’s so much easier to shoot characters talking about something than having them go through the actions. Television has an affinity for the minutiae of emotions as opposed to the broad sweep, the spectacle, the action of a motion picture. The difference is in the complexity of the mounting. 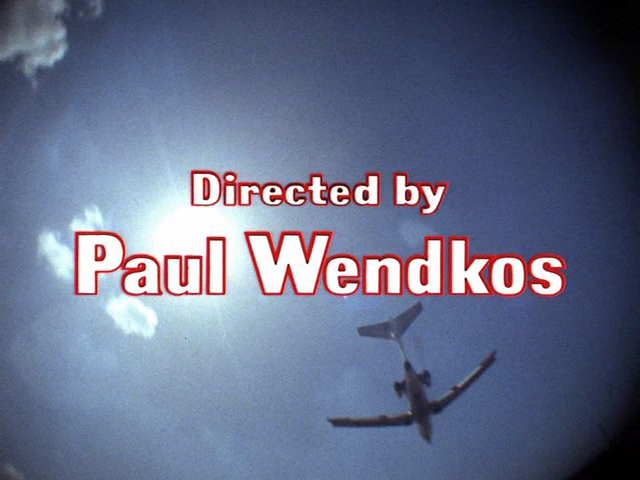 Though he directed a few more theatrical films (including the creepy The Mephisto Waltz, TV producer Quinn Martin’s only foray into features), Wendkos spent most of the seventies on directing made-for-television movies and mini-series, many of which were quite highly regarded. The first of them, a chiller called Fear No Evil, continues to attract obsessive attention; the second, The Brotherhood of the Bell, was a look at a Skull and Bones-type organization that earned Wendkos a DGA award nomination. The Legend of Lizzie Borden, with Elizabeth Montgomery wielding the axe, was a big deal in its day, and The Taking of Flight 847: The Uli Derickson Story netted Wendkos an Emmy nomination. And so on. I should, at this point, be able to offer some specific insights on what made Wendkos one of the best among his generation of TV directors. But that’s tougher than it sounds, even for a specialist like myself. It’s at least a measurable task to isolate the elements in scripts that make a TV writer unique – the repeated themes, the “voice” of the dialogue, the broader control that can come via elevation to producer or story editorship. But to do the equivalent for an episodic director requires a close viewing of many segments, in close proximity, and even then the common elements may remain elusive, or mislead. How does one grapple with the fact that, as a production necessity, episodic television directors (even the best ones) routinely had less involvement in pre- and post-production than the hackiest of movie directors? How many presumably directorial choices were in fact the director’s, and how many were dictated by the producer or the star or the house style of a particular show? Do his Invaders segments more closely resemble Wendkos’s segments of other series, or those Invaders segments helmed by others? TV movies are easier – one can presume a bit more creative control on the part of the director – but most of them are maddeningly hard to come by these days. Little wonder that the expert cinephiles at Dave Kehr’s blog struggled last month to define the Wendkos touch, even as they agreed upon their admiration for it. In his best work, there is a clinical detachment from his characters, which prevents any easy transference from the viewer. His analytic view intensifies the feeling that we are watching insects under a microscope. Some of the insects run bewildered from the various physical and psychological hounds on their trail, whilst others do the pursuing — implacable and imperious. Wendkos’s framing of a cold world is usually meticulously correct, frustratingly proper. It conveys a Langian sense of fate, against which individuals are powerless. To which I’ll add only that the best dramatic TV directors of the sixties, of whom Wendkos was one, had to be equally proficient in their guidance of actors and in their use of the camera. This is an obvious point. But the fact that there are few television auteurs who managed to specialize in one area to the exclusion of the other (in the way that, say, Kazan was an “actor’s director” or Hitchcock a meticulous planner of compositions) makes it all the more difficult to differentiate amidst their work. If I can’t offer a full analysis of Wendkos’s mise-en-scene, I can at least shed some light on one mystery which emerged from that discussion on Mr. Kehr’s site. The authorship of Angel Baby has always been disputed in the reference books. Though Wendkos bears the sole screen credit, the project originated with another director, Hubert Cornfield, who had a similarly uneven and interesting early screen career. (Although when Wendkos segued into television, Cornfield simply disappeared). The press reported during the film’s production in 1960 that appendicitis forced Cornfield off the film, without indicating how much of it he completed before Wendkos took over. In that 1968 interview, Wendkos distanced himself a bit from Angel Baby – he claimed he was promised script changes which never materialized – but also neglected to say how much of the finished work actually bore his stamp. Angel Baby began shooting on location in Florida and Georgia, but was forced back to Los Angeles by uncooperative weather. That may account for the film’s uneven mixture of steamy tropical authenticity and cramped, flimsy-looking sets. Apart from Jens, the visual energy Wendkos brings to the film – lots of tracking shots and low angles, perhaps to suggest the faithful gazing skyward – is the best thing about it. There’s one discrepancy I haven’t resolved, and that’s the question of Wendkos’s age. Most reference books report his date of birth as September 20, 1922, but the obits all state that he 84 rather than 87. If I sort out the facts, I’ll report back. UPDATE, 12/3/09: Lin Bolen Wendkos says that Paul’s birth certificate bears the 1925 date. No one in the family seems to know how that 1922 business got started. Intriguing! Also, Paul was his middle name; his given name was Abraham. Been working on some stuff on Face Of A Fugitive (1959), and digging through Wendkos’ filmography, I realize that when he was good, he was VERY good. Shame you never got around to speaking with him. Thx for your efforts in doing this. Appreciate you preserving my dad’s legacy. Let me know if you need any more info. Have many memories and meorabilia.